RIM, long-time purveyor of fine QWERTY phones, has finally decided it's time to abandon physical keyboards. With that in mind, it appears we're entering a point of no return for such input devices as they continue to steadily disappear from the mobile universe. So, what's a keyboard enthusiast to do? if this patent is any indication, Apple may feel it has the answer. Haptic technology is a way for touchscreen manufacturers to deliver physical feedback when a user touches a button, tries to type using an on-screen keyboard or otherwise interacts with the images generated on their touch-screen display. When it comes to having no physical keyboard, haptic feedback seems like the best available compromise but it's difficult to call it a substitute. Thus far, the haptics found on most smartphones are little more than a quick vibration -- merely an industry platitude, honestly. Apple's solution intends to use a combination of flexible OLED display technology and piezoelectric actuators that would actually alter the contour of your screen. It would also take into account sensor data to determine usage context, providing situationally-appropriate feedback. For example, a device featuring such technology could raise the surface area of each letter for an on-screen keyboard while entering input into a text field. This would give any software-based input instrument a distinct feel and contour for each key or button. When the user is finished typing, the surface of the screen would return its normal, planar state. While companies patent all sorts of crazy things, it was just a couple of months ago that Apple patented the early workings of this idea. 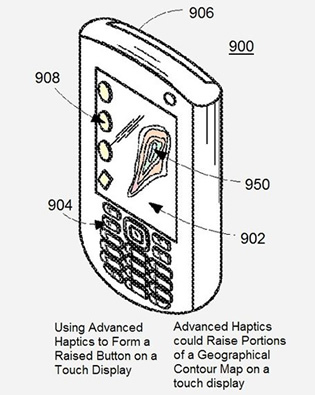 However, the latest patent filing improves upon the design and serves as evidence that Apple continues to investigate haptic feedback for its future, touch-enabled devices.